My new apartment. 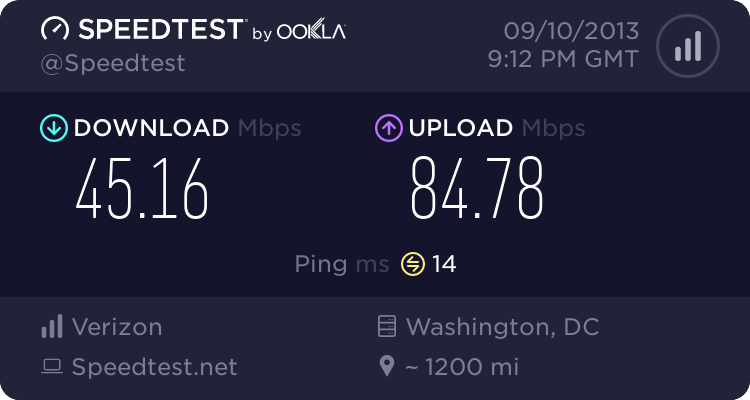 Eh, not great, but I guess it's decent for Comcast in the DC metro area. I left @prag in charge of our internet situation at the new condo. 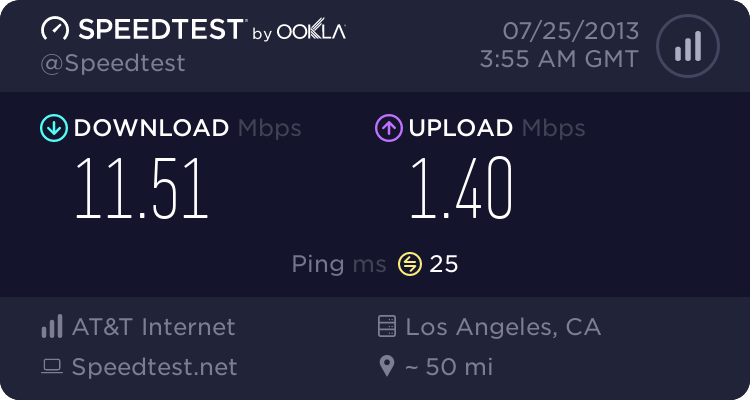 This is at 7am via wireless, can't say I'm disappointed. Let's see how it holds up to both of us using it at once. 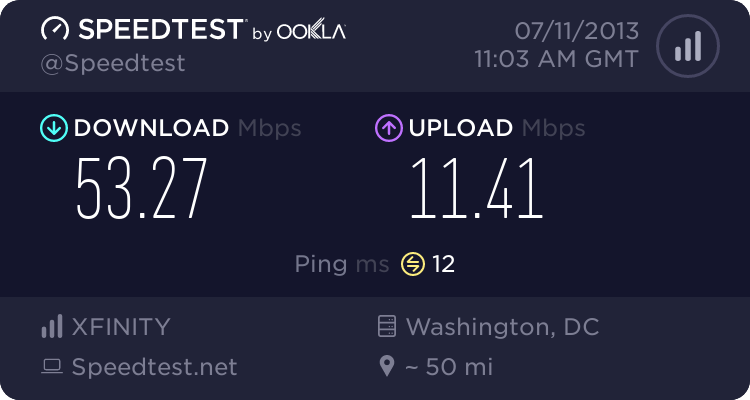 I used to work from home for the above company so I had their DSL to maintain reliable support (ie: Self Support ) if needed. 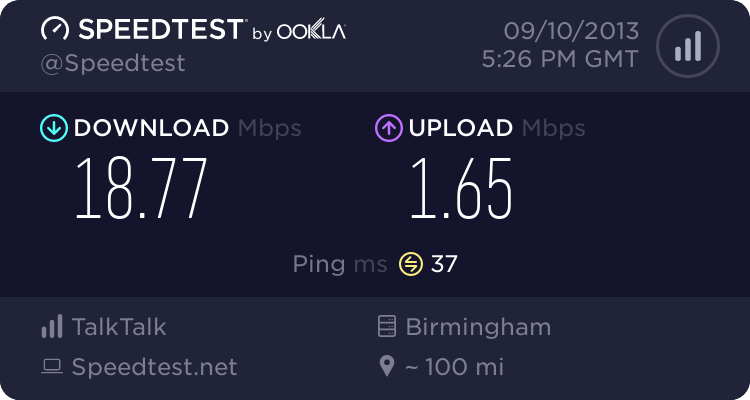 I has the need for speed now and will be switching to ATT Uverse today. 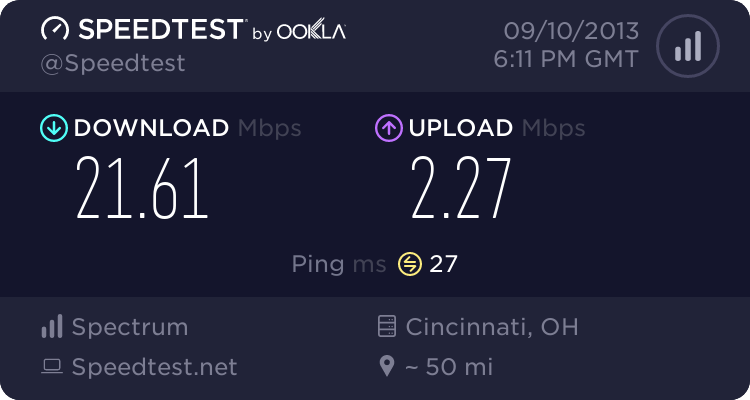 Funny enough an add for Uverse displayed on Speedtest.net as I was doing the above test. After test coming soon. Thank gawd. Your pings were becoming ridiculous. Got a new cable modem recently. I'm paying for 30/3, so I think I'm getting a decent deal. Doubled my download and upload. Went with the medium plan to dodge the $100 "Mandatory installation". Will upgrade even faster as needed. comcast just upgraded us to 25/5 for free (from 20/4, i think). Not seeing the speeds yet...maybe need to restart router :? and/or modem. I'd also give your modem a good 30 seconds or more of off-time to ensure it dumps cache. Is your modem a DOCSIS 3.0 modem, some DOCSIS 2.0's top at 20. Resset (Power off and on after at least 30 seconds), but if no change get ahold of Comcast like usual. Motorola SB6121 Surfboards are good DOCSIS 3.0 workhorses, Walmart has them. Yeah, I definitely meant to type "restart modem", but brain dumped for some reason. 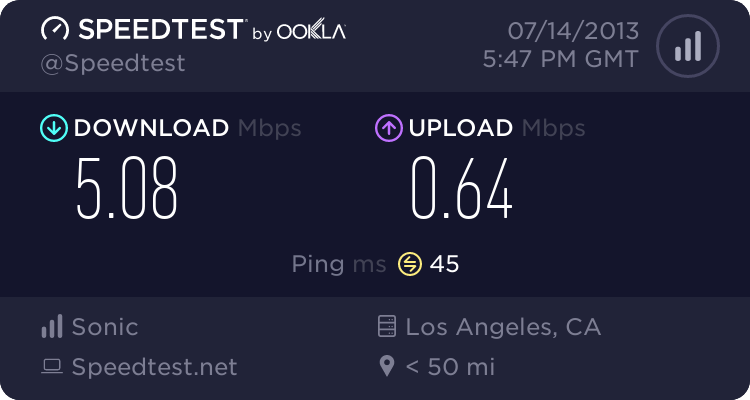 You guys have finally done it (well, you guys plus AT&T continually raising my rates for the same slow connection, then never even delivering the full 1.5Mbit/s). I ordered a DOCSIS 3.0 modem yesterday and am wiring my house for coax this weekend. Comcast, I hate you, but I'll use your service since it's the only one in my area that can give me a decent speed. 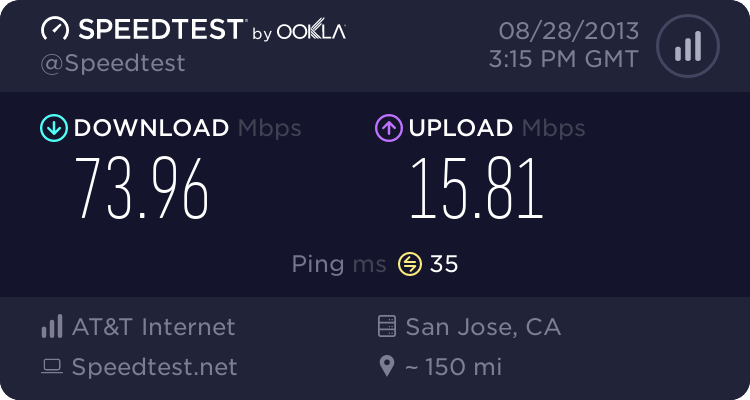 I moved from FiOS to Time Warner ... it hurts how bad upload is on cable, but as you experienced, every other option is worse. 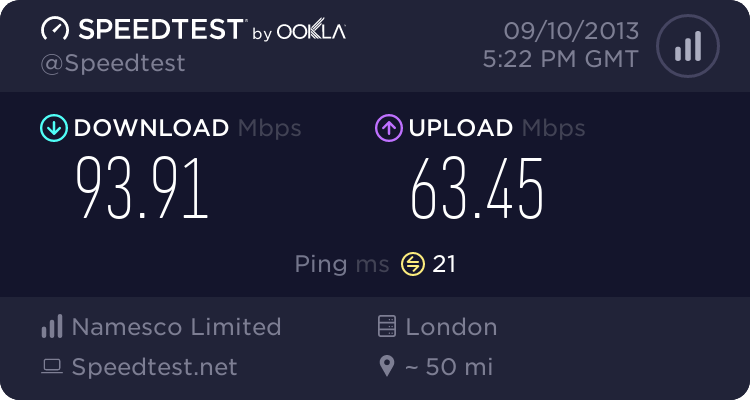 Finally, a proper Internet connection! 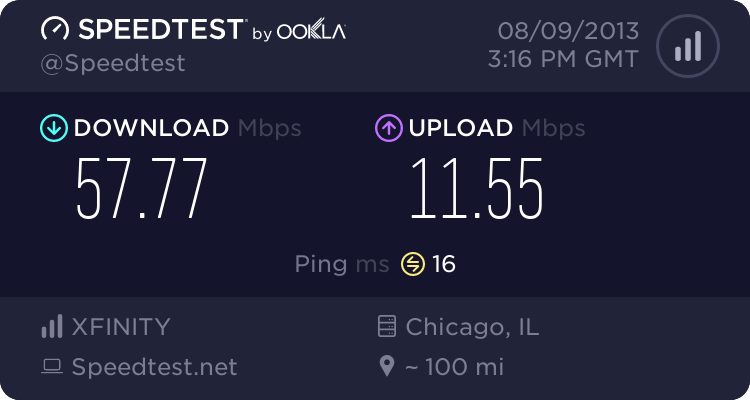 Finally got proper Internet access in Illinois! Had been tethering to my phone the last few days. Got a fancypants new DOCSIS3 modem that's ready for them to crank it up to 11 when the time comes, but I'm hoping that one of the three small fiber companies in this town make it to my place, first. Illinois? Did I miss something? (I'm paying for 40/2 but apparently too far from the break-out box for anything better). 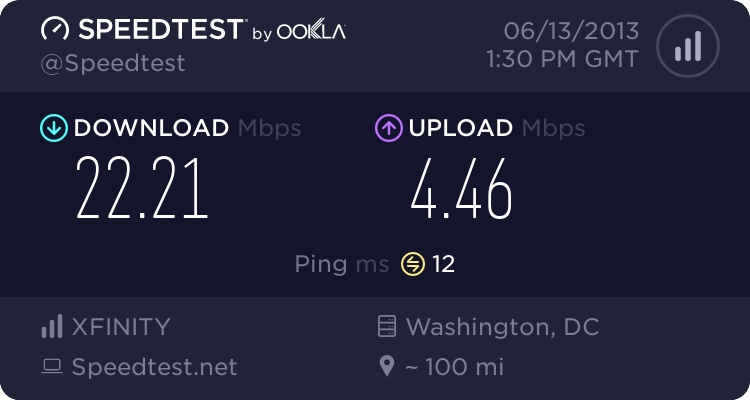 With a DOCSIS 3.0 cable modem and quad channel bonding, this is the result I get almost every time. 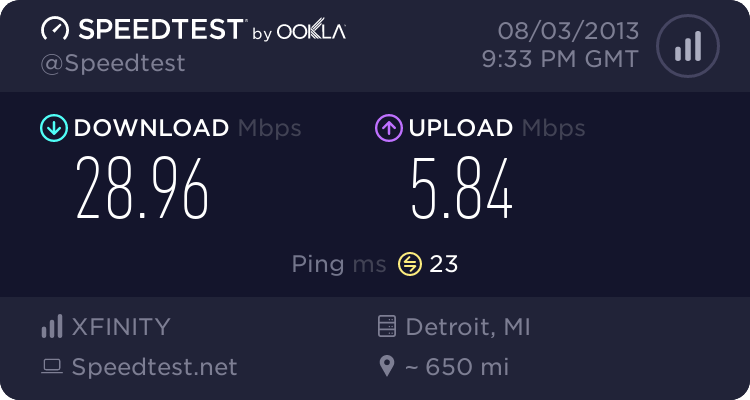 I wish I had the kinds of upload speeds I'm seeing with some of your connections! I found it I think. 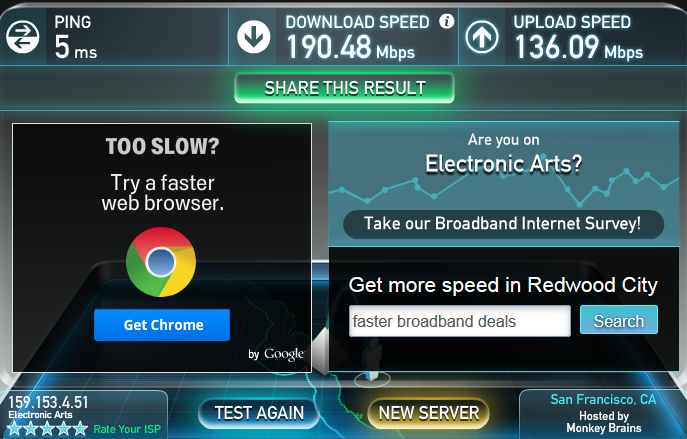 I was hoping to get a much more impressive speed from my server.... stupid ratelimited ports in the old datacenter. 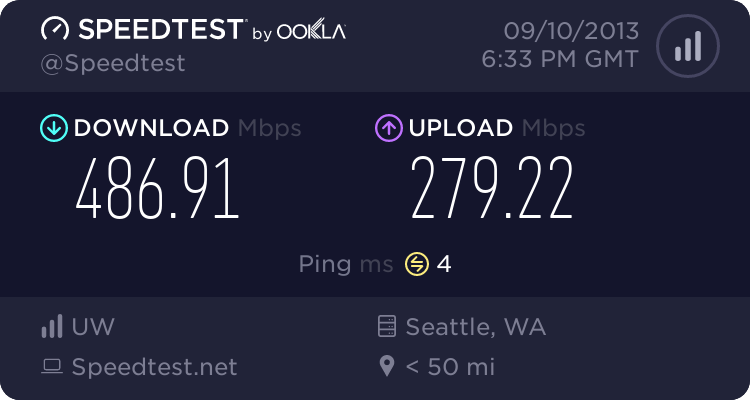 I should talk to network team about setting my port to unlimited. Dickin around on the work's wireless.